Scones. Those little, soft, mild cakes of goodness that differ so much around the world. In the US, a scone comes in a sort of triangle that breaks up like a biscuit. Forget trying to split and spread with jam and cream. In Australia, it is all about how BIG your scones are. The largest I have had was in Tasmania, where they covered the majority of my hand. But in England, being the home of the scone, you can find them everywhere. From flavoured to plain, with jam, cream and/or butter, most places serve a variety of that traditional tea accompaniment. As a pastry chef I have high expectations of my scone. They should be adequately warm all the way through to melt butter, if you are using it. The cream should be fluffy enough to dollop and the outside of the scone should have a slight crispness, giving way to a soft, buttery pillowy interior. And the softness is important - a bite should cause crumbles, not a precise replication of your dental profile. 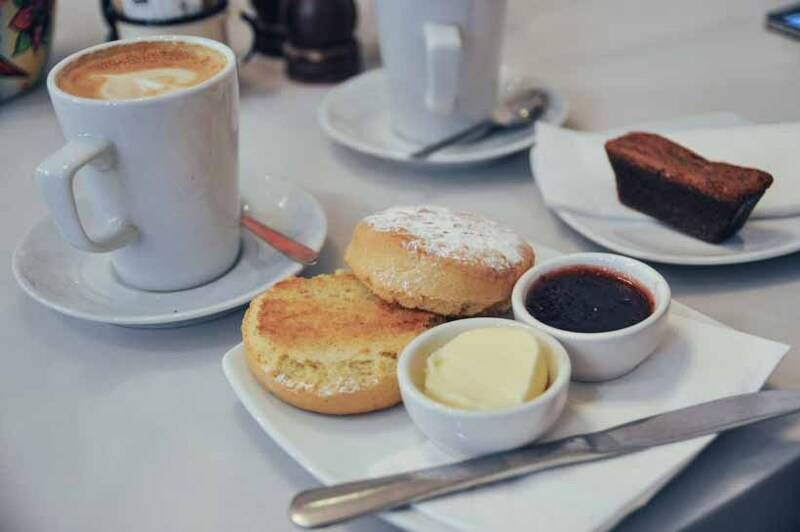 So here are my top five scones in London. While I am a huge fan of a well-made, plain scone, I can't go past the amazing flavours at The Modern Pantry. Green tea scones with gooseberry compote, or darjeeling and pink peppercorn with berry and liquorice jam - their flavours change often and are always interesting combinations. Ok, I might be a little biased by the amazing decorations, the incredible themed tableware, and the excellent realisation of the Mad Hatters Tea Party from Alice in Wonderland, but that doesn't minimize how good the food tastes. To get these scones you have to go for the whole afternoon tea, but you won't regret it. 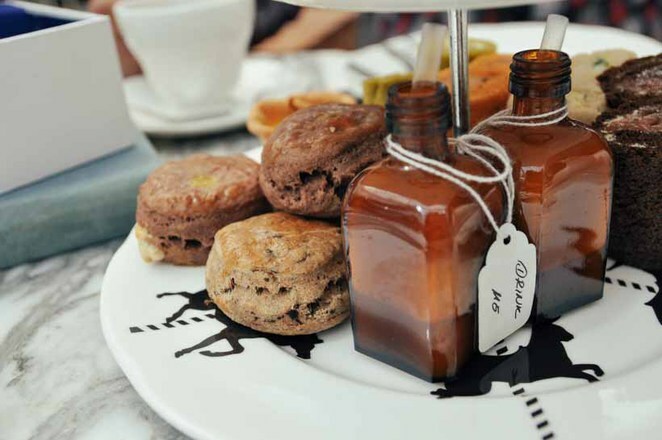 Exploding mango cheesecakes, Drink Me Potions, these are just a few of the nibbles your afternoon tea tray comes with. But the scones, tiny and perfectly round, are very tasty. Surprisingly, it was their savoury olive scones with herb butter that got me. Just the right size to smear with the herby spread and pop into your mouth, they were the perfect balance to the rest of the sweet tea. Otherwise, their double chocolate scones were equally divine. You can read about my experience at the Mad Hatters here. For a traditional afternoon tea, it is hard to beat The Goring. Awarded as Top London Afternoon Tea for 2013 from the U.K. Tea Council's Tea Guild, it is a cannot miss for a traditional experience. Eating scones on the Terrace will be an experience hard to forget. 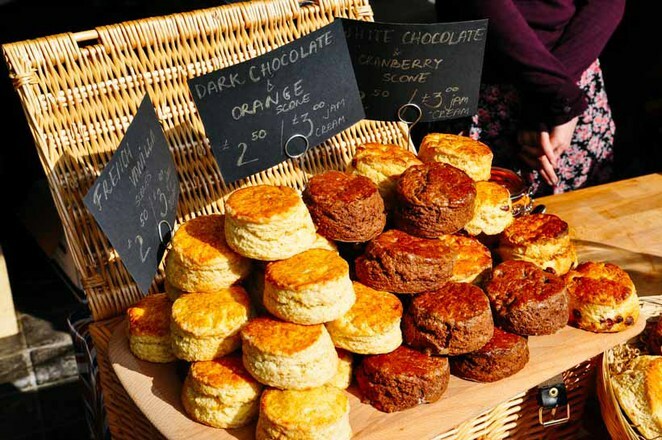 A pop up bakery, this stall can be found at places like London's Real Food Market. If you track them down, don't miss their exquisite flavours such as dark chocolate and orange scones, spelt walnut and dark chocolate, or rose water. I know, it is a chain. I know. But Gail's scones I keep coming back to, over and over again. They serve American style drop scones as well in various flavours such as apricot, blueberry and ginger, but their plain scones are always beautifully warmed, tender, soft and mildly flaky.